This girl loves coffee...Nothing like Iced Cold Coffee on a warm summer day! I love the taste of those cute little iced coffee bottles... you know the ones.... you buy them in 4 packs...and they costs LOTS of money $$! I used to drink the left over coffee pot coffee. Threw a few ice cubes in it and I was good to go....but truthfully, I didn't enjoy the bitter aftertaste. If you cold-brew ~ you will enjoy a smooth, acid-free coffee base PERFECT for a refreshing cold drink...and the cream...wait until you taste the cream!! 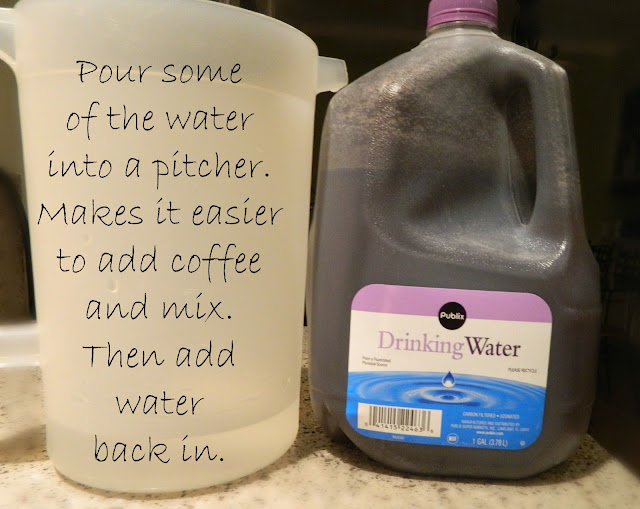 Pour some of the water out of the gallon container into a pitcher. 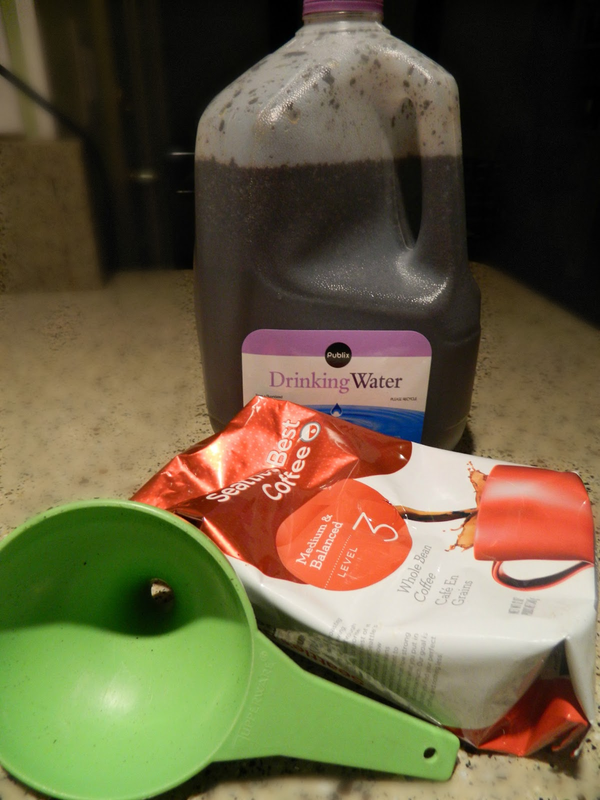 (you'll add it back later) Use a funnel and pour the whole package of coffee into the gallon jug. I usually stop twice, put the lid back on, and give it a shake. I use a fine mesh strainer and coffee filters. (you could also use cheese cloth) I change the coffee filter a few times during filtering. This is a SLOW process, but be patient...it is WORTH it!! I pour enough to fill the strainer and then go do something else, then I come back and add more every few minutes. Now is a fantastic time to make the CREAMER! Pour the Evaporated and Sweetened Condensed Milk together and mix. 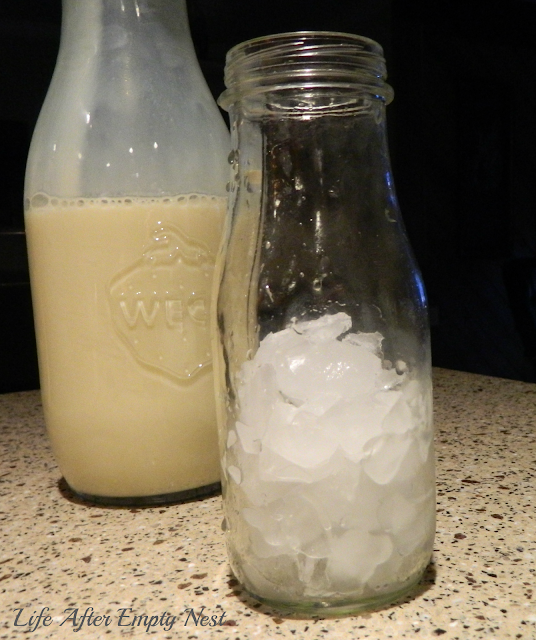 I use this old fashioned milk carafe (that I am obsessed with) and shake. After you have strained the coffee you are ready for a glass of the BEST ICED coffee you've ever had!! Store the coffee and creamer in the fridge for up to a month.... mine won't last quite that long. Now I'm off to enjoy a glass by the pool...while my pups swim! Let me know what you think!! 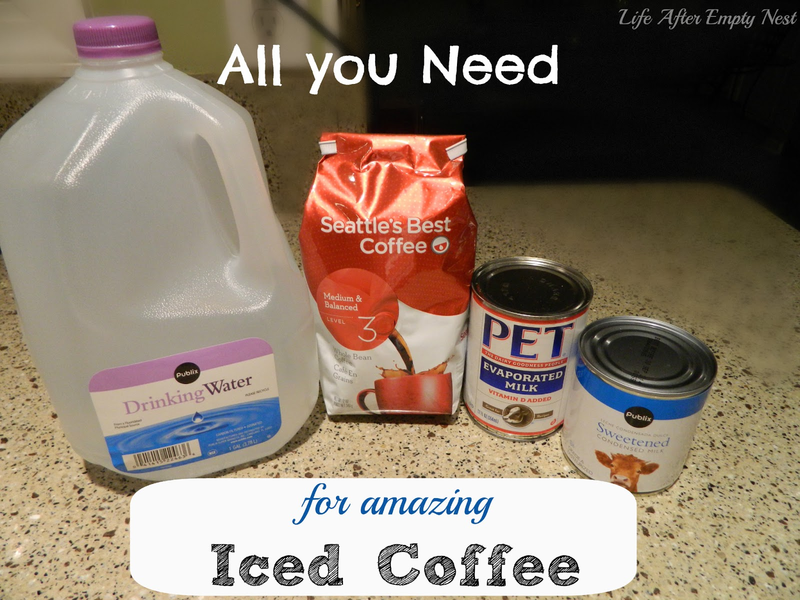 Delicious Iced Coffee for a fraction of the cost!! More Yumminess UPDATE - Love Coffee + Chocolate ??? Make it a MOCHA! Click here to read how! Sign Up For My Latest ~ Straight to Your In-Box! I am so giving my hubby this recipe!! 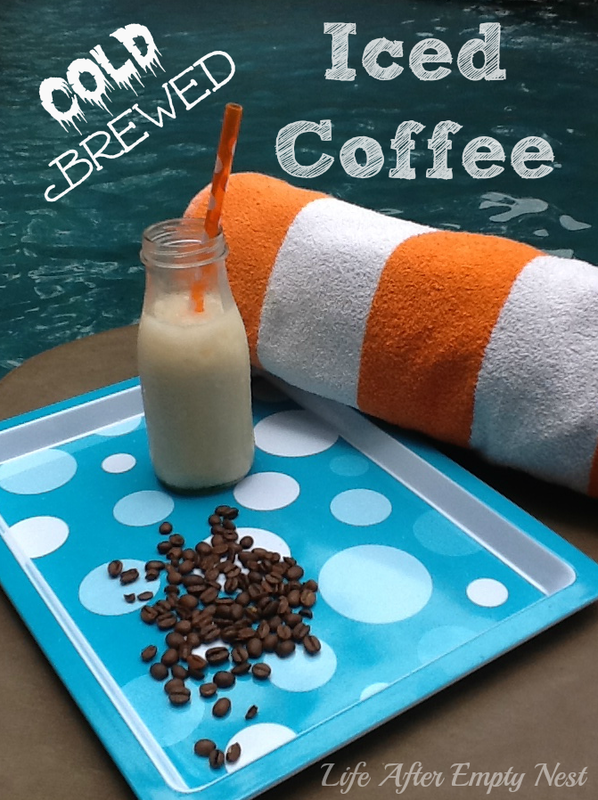 He loves making iced coffee each summer and I'm sure he'd like to try something new! Thanks for sharing! Let me know how he likes it Selene! Just how much coffee are you adding to the jug? I read the directions a few times... didn't see the amount anywhere. Sorry Gail. I use the whole package of coffee. (12 oz) Start with your favorite coffee and use the whole thing!! It depends on your taste. You can adjust the amount the next time if you feel like it was too strong. I look forward to trying this! I like to make decaf iced coffee for the afternoon heat. The creamer looks delicious! I think I'll try the next batch with decaf. I enjoy it in the afternoon as well...been staying up late these hot summer nights! This coffee sounds great. My husband loves iced coffee, I'll have to make this for him sometime. Pinning to try! I'd love for you to share this on my Sweet Tooth Tuesdays blog link party!! I think your hubby will LOVE it!! I hop over and join the party!! Great idea, kind of like sun tea. It is kinda like sun tea...I bet it would brew faster in the sun....hmmmm, now you have me thinking Gypsy Nesters!! Oh my gosh, I am nearly an addict to those cute iced coffees as well, and have resorted to making some coffee cubes (found on Pinterst). But never heard of cold brewing before. Sounds like the perfect solution for me on the weekends - when I hate drinking hot coffee while getting errands done. Thank you so much for sharing this! I'm your newest follower! Ali...I love your enthusiasm! Can't wait till you make it...You HAVE to let me know what you think!! It tastes just like those little bottles....just wait!!! This sounds awesome....new follower on Bloglovin! Thanks Deborah! It is AMAZINGLY Yummy!! I agree...the filtering can be tedious but worth it! Although I don't drink coffee, with my busy schedule every once in a while I'll stop in at McDonalds and grab me a Frappe (I feel they make the best), but I hate those calories! This seems like a great alternative. I have been looking all over the internet trying to find a recipe I like and this one looks fabulous! Can't wait to try it. Oh I have seen where people use coffee cubes (frozen coffee) so it don't water down the taste. I hope you try it Jodi. After you make a glass, you could always put it in the blender with some ice to get the Frappe consistency. This looks great. I've heard of cold brewed coffee but never really knew how it worked. 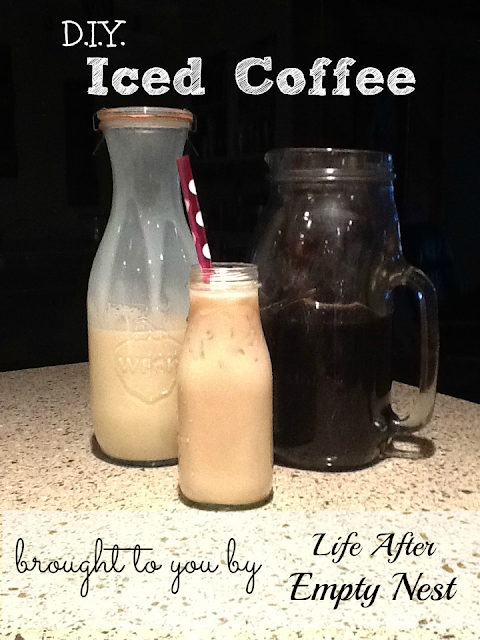 I definitely have to try this my husband and I love iced coffee. Let me know what you think after you try it Joy! My friend hosted a luncheon yesterday and served the iced coffee! Sharon, this iced coffee looks just perfect! Thank you so much for joining us and sharing at Best of the Weekend! Pinning to our party board and hope you will join us again next week. Have a fantastic weekend! Thanks for hosting Cindy! Love the "Best of the Weekend" Party! Yes, PLEASE make the creamer...I tried buying both the milks fat free and it was just as yummy without ALL the FAT! I've never seen it made this way. Is your water cold? I am assuming so. I love coffee! & sipping on an iced coffee as I type. Thanks for sharing last week @DearCreatives sorry I didn't get by sooner. You have to try it this way Theresa! You will LOVE it. Very smooth when brewed this way. The water is not cold, it is room temp. 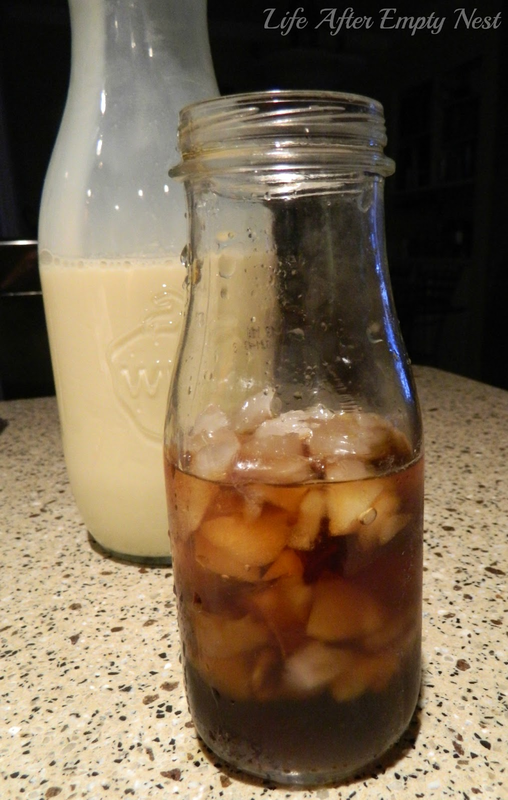 I buy a jug from the store and make it when I get home. I only refrigerate after it is done brewing and I have strained it. I think it is called cold brewed just because you never use heat. Thanks Jodi! Sorry I missed your give away. I'll be on the look out for the next one! oh that seriously looks amazing!! I love iced coffee and cold brew is the best!!! thanks for linking up to nap-timecreations.com Tasteful Tuesday party. You are being featured today in a summer fun round up. 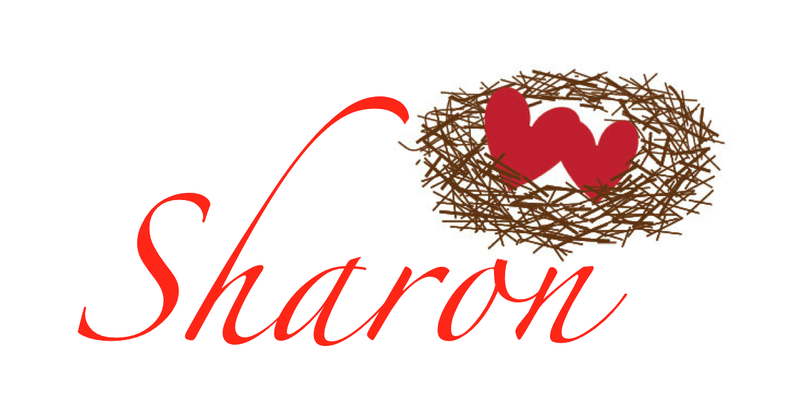 I would love for you to come on over and check it out. Feel free to spread the word of the round up on your favorite social media :o) Thanks! Emily you made my day!! So excited for the feature! I did shout it from every media option!! This sounds delicious! I have never tried cold brew before--now I'm intrigued. I'll have to give it a try! It is amazing how different the cold brewed tastes! Can't wait to hear what you think Michelle! I have a sign in my kitchen that reads I like a little bit of coffee with my cream! So true. I love this recipe! Pinning to my C'mon have a Drink Board. 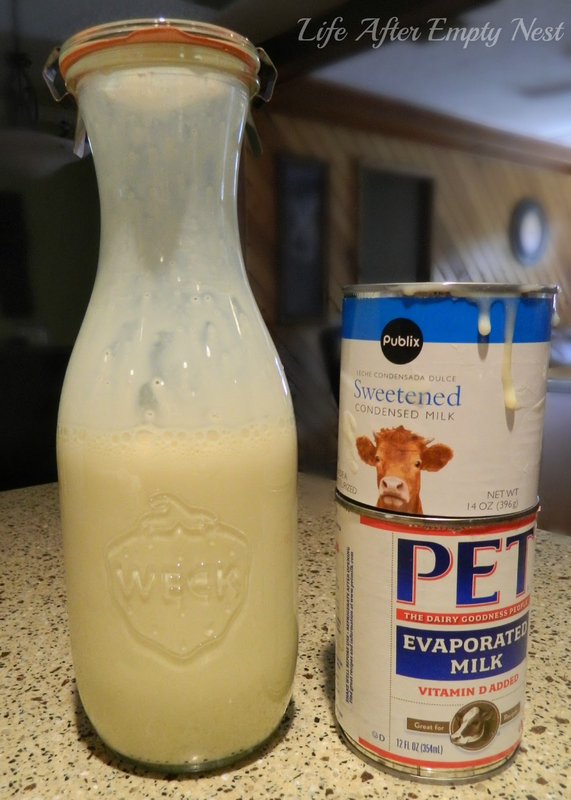 I love the use of the evaporated milk since that is what I use on mine everyday! I should own that sign Lizbeth!! Thanks for the "pin"
My hubby found your blog and this recipe (I don't even know how he found it, connecting links, I think, haha!) I just made it and it's SOOO GOOD!!! Thank you!!! Well your hubby is amazing! So glad he found me and that you LOVE the iced coffee! Thanks for letting me know you loved it! Made my day! Thanks for the invite Marti! I'll link up! I'm confused as to why you need to add water to the coffee? Can I just brew ground coffee in my coffee pot, cool it off in the fridge, and then add the creamer, since the coffee in the pot is already made with water? Then I wouldn't have to filter? Great question Stephanie! The answer is in the taste. When you cold brew it doesn't have any after taste or bitterness. It is hard to explain but it is very smooth. Believe me if it tasted the same I wouldn't go through the work of straining it. Another reader (Marlys above) suggested after it brews strain using a French Press. I tried it and it was so easy. thanks to her that is how I strain it now. Hope you'll try it and see how yummy it is! Thanks for sharing this...you were featured this week at SEW licious Craft Showcase. Thanks Marti! You just made my day!